Our little ones have such a unique imagination. I remember when I was young, playing with my sister, we use to love to play like we were super heroes, of course we loved playing Wonder Woman and Super Girl. Although back then the only way we could actually dress up like our favorite super heroes would be for Halloween. I don't remember there being any play dressup clothes for super heroes like there is now. My son absolutely loves Iron Man. Well, he loves the Avengers. He's watched all of the Iron Man movies and he's seen both The Avenger movies. Even being eight and too cool to give mom a kiss in front of his friends, he still loves to dress up and pretend he's his favorite super hero. So I was pretty excited to give him the Iron Man ARC FX Armor to try. With the armor he is able to slip on the electronic Iron Man glove and matching non-electric glove to take on the identity of one of his favorite super heroes. These gloves look great and just like the real thing. The lighting, sound effects, and motion-activation are pretty awesome too. It helps make pretend play feel even more real. They're well made and very durable, which is great when it comes to an eight year old boy running around the house playing pretend. This goes so well with his Hulk gloves that he has, so when he has a friend over they love playing like they're The Avengers. 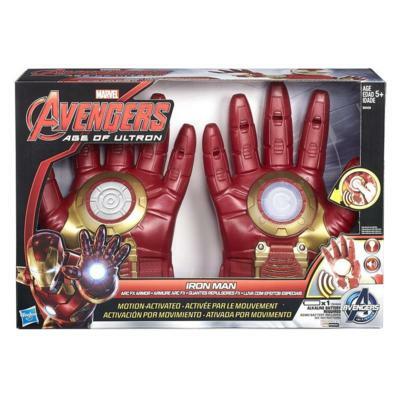 For more information on this and other Marvel Avenger toys be sure to head over to www.hasbro.ca. Disclosure: All opinions are my own. I received Marvel's Avengers: Age of Ultron Iron Man ARC FX Armor at no cost for the purpose of this review. No other compensation was received.